Greece’s 1,400 islands — 230 of them inhabited — are one of the Mediterranean’s most beautiful assets. From the Ionian, up by Albania in the northwest, to the Dodecanese, near Turkey in the southeast, they offer vacations you can’t get many other places. Each of the island groups has its unique allure, plus some of the most picturesque seascapes on Earth. 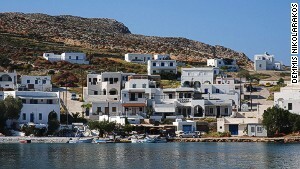 But for sheer variety in a small radius, proximity to Athens’ ferry port at Piraeus and the best inter-island boat connections, none compete with the Cyclades. We present the top nine islands in and around the Cyclades, each with its marquee attraction (for ferry schedules, check www.gtp.gr orwww.greekferries.gr). The story behind this island is the stuff of legends — in 1600 BC after a volcano erupted and its center collapsed into the sea, it left behind parts of its caldera that today form the island Santorini. The views from pretty much anywhere on this crescent-shaped outcrop are superb. Sheer rock faces are striated in multitudinous shades, villages and towns cling to the tops of cliffs, the caldera is filled with clear deep turquoise water home to the visiting cruise liners. The whitewashed buildings in the main town Fira resemble a fresh blanket of snow atop a mountain. On the northern tip, at Oia, where the sunsets are outstanding, houses, hotels and churches tumble down the rock walls. Every evening bus loads of tourists descend to watch the sun sink into the Aegean. The scenery is as just impressive at sea level. Red Beach, as the name suggests, has a rust-colored backdrop and Mars-esque boulders, Eros Beach’s eerie hoodoo-like walls would fit right in at a national park in Utah, and Caldera Beach, the only one that faces in toward the caldera, gives visitors a discernible sense of the volcano’s immensity. Where to stay: Vedema, in the village of Megalochori, doesn’t have a caldera view, but its setting in a small village feels authentic (the town square and village church are a one-minute walk away). The 45 rooms have views of the village homes or the surrounding rolling vineyards. If a vista of the caldera is key, check in to sister property Mystique. Set in Oia, it has a secret wine cellar, and its 22 cave-style rooms are terraced into the cliff face, providing that classic Santorini experience. Mykonos is Greece’s answer to Ibiza, but without the attitude and posturing. Either side of the summer season Mykonos resembles another low-key beach destination but come July and August, night owls arrive in droves, and the main streets of Mykonos Town are packed with revelers — even revelers with babies strapped into carriers. At times the narrow alleys are so jammed with bodies the only way to move is en masse with the crowd as it sways through the streets in a singular motion. In true Greek style, nothing here starts until late, though you can party in the daytime with 20-something Italians at Super Paradise beach. A popular start is to have drinks at sunset at the Sea Breeze Cocktail Bar in Little Venice, snagging a table up the steps for the best views. Across the island at Kalo Livadi you can find an unfussy beach where the new Nice n Easy bio-restaurant has fantastic organic fare at reasonable prices (the pasta with sharp kopanisti cheese is excellent). Back in town, Jackie O’ is a lively waterfront bar that draws the gay crowd, Agyra Bar has attractive, hard-bodied staff from Athens and at the always packed Rock ‘n’ Roll, where local and tourists are evenly split, the bartender blows a whistle before doling out oxygen shots. My personal favorite is the bar/club Caprice, where all are united in their mission to just have fun, no judgments, no agenda; the barmen are as much into the music and dancing as the customers (they’ll readily pour free shots of jelly liqueur). Tip: At Caprice, many a first-timer falls into the area where the bar stools are, set one step down from the rest of the floor, so tread carefully. Where to stay: Hotel Kivotos, on Ornos Bay, is removed from the hubbub, set on a hill with steps down to a peaceful rocky beach, and is an ideal refuge to refuel and recharge. The cool rooms have clear Lucite chairs, LED lights in the floors (sounds tacky, but looks appropriately festive), a pool with a small circular bar, and most importantly, an energetic, attractive young staff that will give you the scoop on the best night spots. Where village life is the only life. The largest island in the Cyclades has a string of swoon-worthy beaches on its west coast, a Venetian castle in its main town, some interesting ruins and great local produce and dairy. But what sets it apart from the other islands are its traditional villages. There are 46 of them on Naxos, some miniscule, but all a window into traditional life. Each has a bakery or cafe, a village square where old men with sun-creased faces sit around on tables drinking coffee and trading stories and an immaculately preserved church or two. The hamlets are tucked among the hills and the switchback road that crisscrosses the island. Kinidaros is famous for its bakery (the best on the island, the oven fired by wood) and musicians; Chalki has the excellent artisanal jam shop Era; locals come to the cobble-stoned streets of Apeiranthos to eat the crepes at Samardako; Keramoti sits in a valley, seemingly cut off from civilization, but it’s also the base for hikes to Routsouna waterfall. Since most tourists don’t venture inland, the villages haven’t succumbed to money-grabbing gimmicks. Where to stay: Set away from the coast, Naxian Collection has good views of Chora, a handful of typical Cycladic white cubist villas with private pools, an on-site organic garden with fresh strawberries and breakfasts large enough to keep you going all day. The likeable owner Ioannis Margaritis was born and raised on the island, so he knows everything about, and everyone on, Naxos — literally. If you’re lucky, he’ll take you to a barbecue at his friend’s house in one of the villages. The constant wind on Paros is evident as the ferry approaches the island — you can see giant turbine fans steadily cartwheeling on the north coast. While Paros might be as cosmopolitan at Mykonos (without theLouis Vuitton and Diesel stores) and pretty enough to attract Hollywood royalty (Tom Hanks purchased a house in the neighborhood, on sister island Andiparos), the real draw here is the force of nature. During the summer, the Meltemi winds blaze down through the Aegean, supplying welcome breezes for beachgoers, but also creating conditions ripe for windsurfing and kiteboarding. 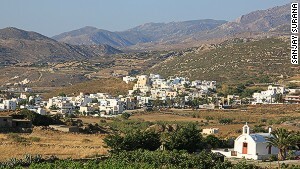 The winds peak in intensity during July and August; the five-mile channel that divides Paros from its neighbor Naxos funnels the Meltemi to glorious effect. The main beaches for the sports are Pounda on the west of the island and Santa Maria, Golden Beach (Chryssi Akti), and New Golden Beach (Nea Chryssi Akti) on the east (New Golden Beach’s winds are so reliable that The Professional Windsurfers Associationheld its World Cup there for six consecutive years in the 1990s). For newbies, mornings are the best time to learn, when the wind is steady but tame. By early afternoon, when the gusts pick up and continue till dusk, pro boarders and windsurfers skim and bounce along the water. Established operators include Paros Kite Pro Center, Force 7 Paros, and Paros Surf Club. Visitors should time their visit around the island’s most important festivity, on August 15, celebrating the Virgin Mary’s ascension to heaven and culminating in a giant fireworks display mounted on boats in the bay of the port town Parikia. Every islander has their favorite beach, but none of the Cyclades promises the number and diversity of beaches as volcanic Milos. Some have white sand, some black, some are rocky, others offer the satisfying sensation of crushed shells underfoot, with water ranging from emerald to aquamarine to cobalt blue. With a heavily indented coastline (on a map Milos resembles a mutated crab) and pretty little coves at every turn, Milos has about 80 fine beaches, many only accessible by boat. While each has its charm, some should not be missed. Sarakiniko, a beach of brilliant white pumice, looks truly otherworldly (many liken it to the moon). The three beaches of Paliochori are cupped by towering rock formations, its pebbles are multicolored and the sea water has warm pockets where it’s fed by hot underwater mineral springs. The small Tzigrado beach is flanked by headlands, and can only be accessed by boat or by a ladder down the cliffs. A cave borders the even tinier Papafragas beach, while the rock walls that enclose it give the water the appearance of a river starting in the sand. At Paliorema beach you can wander around an abandoned sulfur mine plant, see the wagons used to transport the chemical and look for sulfur crystals growing among the rocks. Where to stay: Since visitors will likely camp down at a different beach every day, it makes sense to stay close to the main port of Adamas where taxis and boats are easy to organize. Villa Notos has simple rooms in Cycladic colors of blue and white (some have terraces), Greek-made Korres toiletries, pretty views of Adamas Bay and is within walking distance of the town’s restaurants. Top choice for outdoors people. This rugged, wing-shaped island on the cusp of the Cyclades and named for Icarus — the son of Daedalus who fled from Crete, got too close to the sun and tumbled into the sea just offshore — has gained fame for the longevity of its residents. Their diet, strong community and daily exercise mean Ikarian men are four times as likely as American men to reach the age of 90, according to a study by the University of Athens Medical School. The 99-square mile island is basically one large mountain, peaking in the central Pramnos-Atheras range. For such a small area, the geographic variation is astounding — Ikaria has rivers and tiny lakes, high forests of pine and oak, and hills at every turn that combine to make Ikaria an Elysian Field for outdoor buffs. 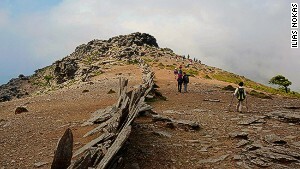 Ikaria’s network of mountain paths known as monopatia is an informal web of routes that connects villages. The hiking guide “Round of Rahes on Foot,” published by the local municipalities, details tracks and trails on the west of the island and also maps out a 15-mile tour along monopatia through the hills and villages of northwest Ikaria. The trek brings hikers through farmland, bush, forest, past lakes, along donkey tracks, skirting goat herds and introduces visitors to the unhurried pace and uncomplicated nature of Ikarian life (this is an island where bakeries use the honor system). Actually two islands, Kato and Ano (meaning lower and upper) Koufonisia, with the former almost uninhabited, are like a land that tourism forgot, mainly because the quickest ferry from Athens takes six hours. Home to only a few hundred residents, Ano Koufonisi is tiny, just 2.2 square miles, so walking or cycling round the island are the most efficient modes of getting about. The main industry, apart from the creeping reach of tourism, is fishing, and the main town of Chora retains the feel of an untouched fishing village, with small boats bobbing in the harbor. There’s not a whole lot to do here, but that’s the idea. You can hire a caique (traditional wooden boat) for a trip to the nearby island of Keros, where examples of early Cycladic figurines have been carefully excavated. Santorini is often the go-to island for couples in these parts, but another Cycladian island where houses perch on clifftops is an even better escape for lovebirds. The mountainous, mostly treeless Folegandros doesn’t get the crowds of the islands around it thanks to sparser ferry service, a boon for twosomes in search of some solitude with their sun and sand. The main village of the island, Chora, set on a cliff plateau 650 feet up, embodies the archetypal image of Cycladic buildings of small white houses with blue doors lining cobblestoned street. The Kastro, the Venetian part of Chora, is well preserved while the majority of the island appears as it has for centuries, devoid of buildings in favor of open landscapes. Donkeys remain a widely used means of transportation and goats scramble up and down the sun-baked hills. Painters and writers from Europe come to Folegandros for quiet inspiration and the most enduring memories of a visit here are the silence and the bays with crystal clear water. The one not-to-be-missed site is the northeastern cave of Chrysopelia, where ancient names are written in clay into the walls, a custom from the Hellenistic Period. A 90-minute high-speed catamaran ride from Santorini, Crete is Greece’s Wild West, where the locals are fiercely independent and have a fondness for guns (used, I’m assured, only to shoot at street signs or into the air during festivities). Its 3,200 square miles are blessed with scores of microclimates, fertile soil and crops that haven’t succumbed to the scourge of industrial farming. Which means that the tomatoes, cucumbers, eggplants, strawberries, watermelon and other fruits and vegetables that grow here taste as nature intended. The topography of central mountains ringed by shimmering coastline allows two growing seasons — lower elevations in the winter, higher elevations in the summer — and Crete is a hub for olive oil, cheese and wine production. Eat at a traditional taverna (even a touristy one) or kafenio (Greek café) and you’d be hard pushed to have a bad meal because the raw ingredients are so darned good. Elounda, on the island’s northeast coast, is surrounded by some of the island’s great agricultural areas, like the Lasithi plateau, has a selection of hotels for all budgets, and some excellent examples of what makes Greek mainlanders sigh when they think of the divine freshness of Crete’s cuisine. Ergospasio Restaurant, a former old stone carob factory, serves just-caught seafood overlooking Elounda harbor. The Ferryman Taverna is a local favorite, and for reason — the mezes make great use of Crete’s agricultural bounty. Manolis Kafeneion on the main square is a great spot to share meze and raki (a fiery alcoholic drink made with grapes that locals drink after a meal) with Cretans.